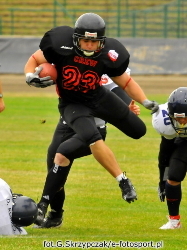 The Final of the PLFA 2008 (Polish American Football League)to take place this Saturday in Wrocław, Poland. a week later – an international friendly between Poland and Germany! This upcoming Saturday, October 18, at the Olympic Stadium in Wrocław, Poland, the top two teams of the third season of the Polish American Football League will square off – the Pomorze Seahawks and the Warsaw Eagles. Kickoff of the final game of this year’s football season will take place at 5:00 pm (CET) and as an evening game, it will be played out under artificial lighting. Polish Bowl III will also witness: the final of a several-week long competition to become a Sista Crew cheerleader, as well as contests for the fans at halftime. In order to increase the attractiveness of the game for the spectators, the game will be accompanied by professional commentary and the fans will be able to view instant replays on a large video screen – an absolute first at PLFA game. Upon entrance to the stadium all spectators of Polish Bowl III will receive a hard copy version of SNAP – an American football fan magazine. It will include a summary of this season, information about the finalists, their line-ups, as well as, some basic rules of American Football and guidelines that will help follow the game. Additionally, a special surprise is being prepared for the fans – the first 50 females, who show up at the Olympic Stadium will receive T-shirts from The Crew Wrocław club, which is the organizer of this event. There will be no entrance charge for the first 500 spectators, afterwards tickets will cost 7 PLN. This year’s final will be a re-match of the championship game from the very first PLFA season, when the Warsaw Eagles handed the Pomorze Seahawks a lopsided 34:6 defeat. These two teams have met three times, each game resulting in a Warsaw Eagles victory. The most recent game took place September 21 this year in Warsaw. A win in that game would have sealed an undefeated regular season for the Pomorze Seahawks, a feat previously achieved by the Warsaw Eagles in both the 2006 and 2007 regular seasons. However, the Eagles themselves would not let that happen by decisively defeating the Seahawks 22:0. While losing that game, the Seahawks still secured the number one seed prior to the playoffs. There they met the Devils Wrocław in the PLFA semi-final on October 5. After an even match-up, where the last play of the game – a defensive stand proved decisive, the Seahawks defeated the Devils 24:20 and earned their place in Polish Bowl III. The second semi-final witnessed a clash between the previous two PLFA Champions – the reigning The Crew Wrocław and Warsaw Eagles. After a dramatic and captivating game, the Eagles beat The Crew by the smallest of margins – 8:7. The semi-final victories of the two finalists were not decisive. Both the Seahawks and the Eagles had their share of luck, as both their opponents showed more initiative. If only the Devils continued to play the latter half of the game as in the first (which they won 20:14), and if The Crew had been more consistent (several turnovers late in the game) Polish Bowl III would be witnessing a cross-town rivalry of two Wrocław teams. When asked what the Warsaw Eagles have to do to redeem the national title, Grzegorz Mikuła, the manager of the Warsaw Eagles, said: We have to play concentrated and forget about our recent lopsided victory over the Seahawks. Especially, because of the result – we simply scored, they didn’t. The key to victory will also be minimizing yards lost on penalties. This year we’ve played games where we had very few penalties and others where the officials were throwing yellow flags all over the field – he admitted. Asked whether on Saturday we will witness a captivating game, Mikula confirmed: it will definitely be a game filled with finesse plays. It won’t be only about physical strength. Maciej Cetnerowski, coach of the Pomorze Seahawks shed some light on their practices prior to Polish Bowl III: we aren’t preparing any special plays against the Eagles. We are intensively working on improving those aspects of our game, which faltered. We’re just tuning up the plays we’ve used since the beginning of the season. Questioned about team spirit, Cetnerowski added: - The team is positive and ready for a fight. We’re concentrating now more than before any previous games – after all, this Saturday we have a chance of winning the national title. The players are aware what is at stake, but the key will be calmness and self-control. We are really counting on good weather, as this will allow us to demonstrate all our offensive plays – added the coach of the Seahawks. The highlight of Saturday’s final will be a clash between the balanced offence of the Seahawks and the versatile defense of the Eagles. The key to the Seahawks’ success may lie in their ability to stop the Eagles’ well-known running game. The team that wins this year’s Polish Bowl will receive a trophy that from the 2009 season onwards will be passed on to subsequent PLFA Champions. For those fans that will not be able to attend the game, the PLFA has prepared a surprise – the course of the game may be followed live via the official webpage of the league: www.plfa.pl. Apart from play-by-play information, regularly updated statistics will also be available. Honorary guests of Polish Bowl III will include Mr. Robert Huber, the President of the European Federation of American Football, Mr. Uwe Talke, the EFAF Director of Club Team Competitions, as well as representatives of the dynamically growing national federations – Hungary (President Laszlo Toth) and Serbia (President Vladan Lapcevic). An exciting week to come in American Football in Poland! The day after Polish Bowl III, we will witness the first ever final of PLFA II (Division II football) in Białystok, Poland. In a game that will decide which team will play in PLFA 2009, Białystok Lowlanders will host the Torpedy Łódź. The defeated team will then match-up on November 8 with the 7 placed team of the PLFA – Kozły Poznań, to earn the right to play in PLFA 2009. A week after Polish Bowl III, on Sunday October 26, we will witness the first ever game of the U-19 Polish National Team. It will square off in a friendly with the reigning European Champions – the German National Team in Będzin, Poland.